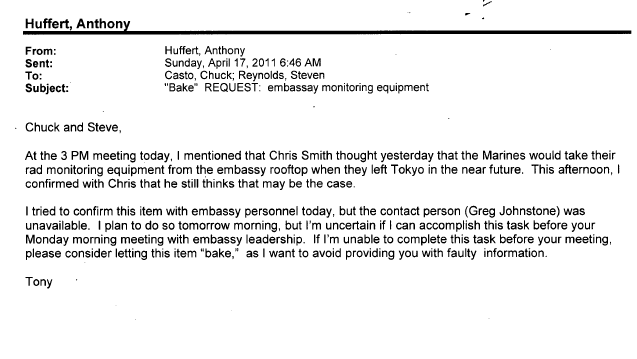 At the 3 PM meeting today, I mentioned that Chris Smith thought yesterday that the Marines would take their rad monitoring equipment from the embassy rooftop when they left Tokyo in the near future. This afternoon, I confirmed with Chris that he still thinks that may be the case. I tried to confirm this item with embassy personnel today, but the contact person (Greg Johnstone) was unavailable. I plan to do so tomorrow morning, but I’m uncertain if I can accomplish this task before your Monday morning meeting with embassy leadership. If I’m unable to complete this task before your meeting, please consider letting this item “bake,” as I want to avoid providing you with faulty information. April 17th, 2011 – What about Fukushima internal doses and bioassay confirmations?